To prepare the blanket for the edging, form a loop with the yarn, and with the front of the blanket facing you, make 2 sc into one of the corners. Sc evenly across each edge, putting three sc in each corner. Back at the beginning corner, make one more sc in the beginning corner and slip stitch to join to the first sc. Row 1: Ch 3, 4 dc in same sc. Cdc in next sc and along the row until reaching the last 2 or 3 stitches. If there are two sc before the corner sc, then cdc as you have been. If there is only one sc before the corner sc, cdc by working in the next sc and then going behind it to made the other dc in the same sc as the prior stitch. Make 5 dc in each corner sc. 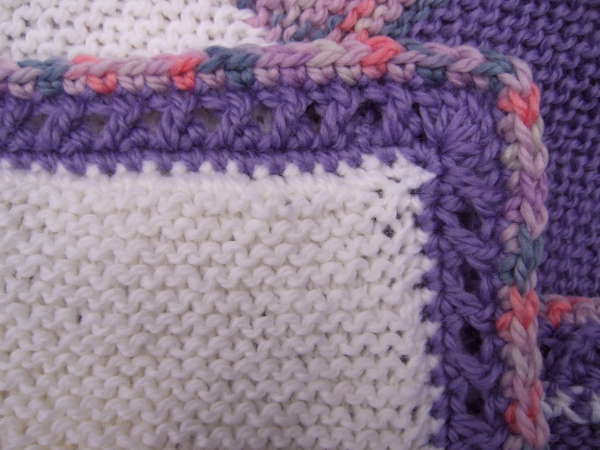 Work all the way around the blanket and slip stitch to join in the top of the beginning ch-3. Row 2: If you are using a different color for this row, finish off row 1 and begin row two by forming a loop and making a sc in any stitch. If you are continuing in the same color, you can ch 1 and sc in the same stitch. Sc in every row 1 stitch around, putting 3 sc in each corner stitch. Slip stitch to join in the first sc. Finish off and weave in end. all of your work is beautiful. It is a bit intimidating. I have been wanting to make a quick garter stitch blanket for a charity but wanted to finish with a crocheted border. Well done. This is just the ticket. Thanks for the gnerosity of sharing your skills with others. Iwould like the pattern to an easy blanket like above. The blanket on which I made the edging was just strips of garter stitch knit (knit every row) that I sewed together. I love your patters and have made 2 of your afghans. I have almost finished your crazy ripple blanket the one with the diamonds in it. Do you think this will look good on the sides of it or should I do another border and if so which one. I think this one works great on any straight edge. I would just advise that putting any border on the rippled ends of a ripple blanket involves some modification to conform to the “peaks” and “valleys”. this looks beautiful but a bit SCARY. Is there a tutorial available?? I just need enough to get me started then I’m good to go!! I learned to crochet AGAIN from tutorials on YouTube. Thanks for the pattern and any help you can give me with a tutorial. Love this edging! beautiful and quick! I put a “crab” stitch instead of the basic sc, it worked out great! I am a beginner and have a baby afghan I crocheted with ripples. I want to put an edge on the straight sides to make them look nice. Will this work for the edges? Would any modifications be necessary? You can put pretty much any edging on the straight sides. Only edges added to the rippled top and bottom would need modification. I’ve been looking for a border for my current project, a corner to corner afghan. I think this one will fit the bill. Thank you for taking the time to write the pattern and take a photo. Can’t wait to finish the blanket so I can start on the border.